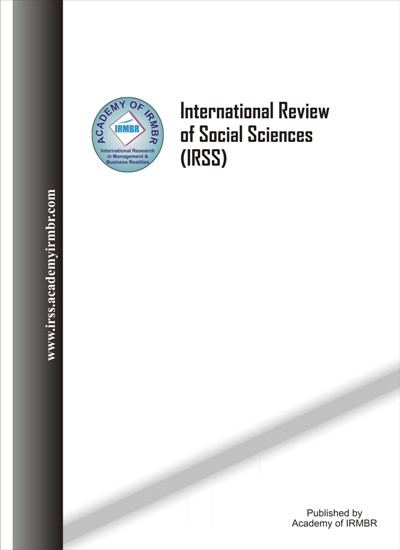 International Review of Social Sciences (IRSS) is an open-access monthly journal published by Academy of IRMBR. It invites research papers on various research themes relevant to social sciences. The journal is interested in publishing research papers that provides sound and clear theoretical insights with practical implications for the business and societal wellbeing. As per the title of the journal, it calls for papers on any business or management topic that challenges the traditional wisdom of the readers. The topics may include a wide range of research areas, for examples Anthropology, Business studies, Communication studies, Criminology, Demography, Development studies, Economics, Education, Geography, History, Industrial relations, Law, Linguistics, Media studies, Political science, Psychology, Public administration, Sociology, Legal Management, Paralegal studies, International studies, Library Science, Information Science and any other area that can fall under the scope of social science discipline.